Peonies are grown for their large showy flowers. The large fragrant flowers often appear in cut flower arrangements. 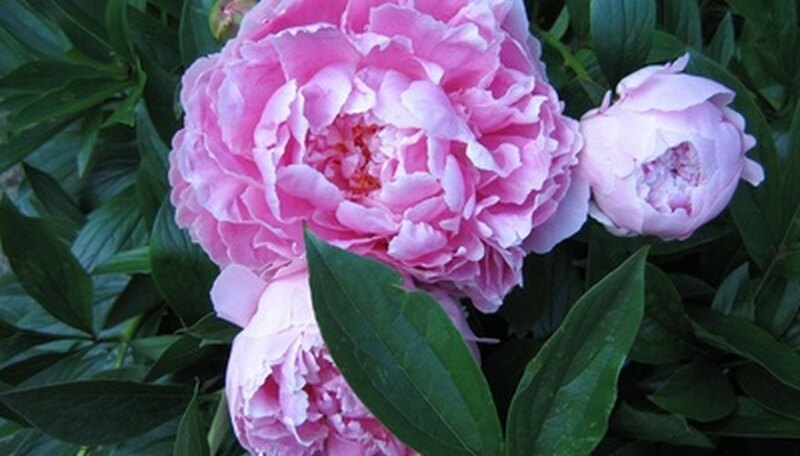 Peonies grow 2 to 4 feet and prefer full sun and well drained soil. These perennials are hardy in USDA Hardiness Zones 2 to 8. Although peonies have few problems, they are susceptible to some diseases. The best cure for all diseases is proper cleanup and maintenance of the plant. Spent flowers should be removed and the plant should only be watered at the base. After trimming diseased plants, pruners and other tools should be cleaned with bleach or alcohol before they are used on healthy plants. Do no put diseased plant material into a compost pile. Botrytis blight is a fungal disease that is caused by wet spring and summer weather. Symptoms of this blight include spots on the leaves, soft decaying stems and rotting flowers. Buds become blackened, do not open and are covered with fuzzy fungal spores. The treatment of this blight requires removal of the infected parts and treatment with a fungicide labelled for Botrytis blight. Moist weather also causes leaf blotch. This fungal disease causes dark purple spots on the upper side of leaves. These spots are often glossy. Treatment of leaf blotch includes removal of infected parts, application of appropriate fungicide and watering only at the base of the plant. A fungus in the soil causes Phytophthora blight. This blight causes plants to darken, turn black and become leathery. The only solution is to remove the plants, destroy them and remove any diseased soil. For best results, do not replant the area with peonies. Verticillium wilt is caused by the verticillium albo-atrum fungus. This is a soil borne fungus. Leaves wilt, turn yellow, turn brown and die. This disease starts at the base of hte plant and travels upward. Although infection often occurs in cool weather, the symptoms may not be visible until the stress of warmer weather. This disease has no cure. Plants must be destroyed and the soil removed. Sclerotinia sclerotiorum causes white mold to form on peonies. The stems rot and the plants wilt. The infected parts of the plant turn light tan and become dry and stringy. Sometimes a white mold appears, thus the name. White mold is a soil fungus, so there is no cure except to destroy the plant and plant peonies elsewhere.